Microdermabrasion is a type of exfoliation. Unlike the exfoliation you can do at home, however, it uses advanced technology to fully remove any dry, dead skin cells that are on the top layer of your face. Microdermabrasion sloughs off those cells to reveal younger, healthier skin cells. Your skin is instantly transformed. On its own, your Los Angeles microdermabrasion treatment will leave your skin looking healthier, younger, and more even. It can also be added to other treatments to improve their effectiveness. Once the top layer of skin is removed, oxygen and light therapies can penetrate more deeply, improving your results. Any other treatments – and even the topical creams you use at home – will be able to do more for your skin because they can sink in deeper. It thickens collagen. Collagen helps your skin look firm and young. When you’re a kid, you have plenty of collagen. Over time, however, your body slows production of this protein. The deep exfoliation of microdermabrasion encourages it to kick collagen production back into high gear. It reduces the appearance of fine lines and wrinkles. The top, most damaged layer of your skin contributes to the depth of your wrinkles. Underneath that top layer, healthier skin cells are waiting. Microdermabrasion can help your younger skin cells reach the surface, lessening the noticeability of any fine lines and wrinkles. It helps clear skin of acne and acne scars. 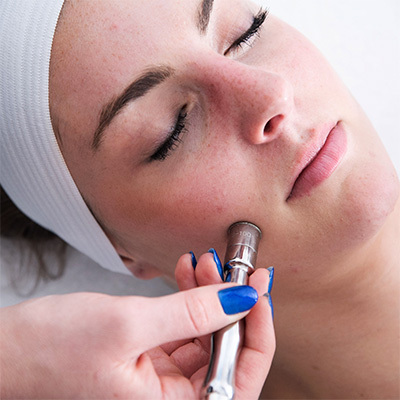 A microdermabrasion facial can help you get rid of current acne and scars from the past. Removing the top layer of your skin helps unclog your pores, giving them the opportunity to achieve a healthier oil balance. It can even remove blackheads. At the same time, stripping away the top layer of skin lessens the appearance of scars. If you’re looking for a way to get rid of scarring from acne, microdermabrasion is a great solution. It evens skin coloring. Hyperpigmentation and other instances of skin discoloration or uneven skin tone often result from irregularities on the top layer of the skin. By removing that top layer, you can reveal a more even skin tone. Some microdermabrasion procedures lean on crystal-tipped and vacuum suction tools to remove the top layer of skin. This can be painful for the person undergoing the treatment. What’s more, if not carefully controlled, it can damage your skin. At Face of Jules, we have chosen to use the crystal-free, suction-free Sapphire3. This gives us a pain-free, safe, and powerful way to remove the topmost layer of skin. With our technology and experienced precision, you’ll see an immediate improvement in your skin’s texture, tone, and overall appearance. If you’d like to see how a microdermabrasion treatment can help you reveal the healthy, glowing skin that’s hiding under your topmost cells, get in touch with our team at Face of Jules today.